Place the ginger in a blender. Pulse until fairly smooth and liquidy. Add the remaining ingredients and pulse until smooth. Pour into ice pop molds, leaving a bit of headroom for expansion. Freeze until solid, about 6 hours or overnight. Note: If you use a high powered blender, the blackberry seeds will be nearly nonexistant. If your blender isn't very powerful and you are seed adverse, press the berries through a sieve before adding them to the blender. The unofficial blackberry week continues! It has been a hot and steamy week here in Baltimore. Most days it has been at least 90 with anywhere from 80-98% humidity. Oy. 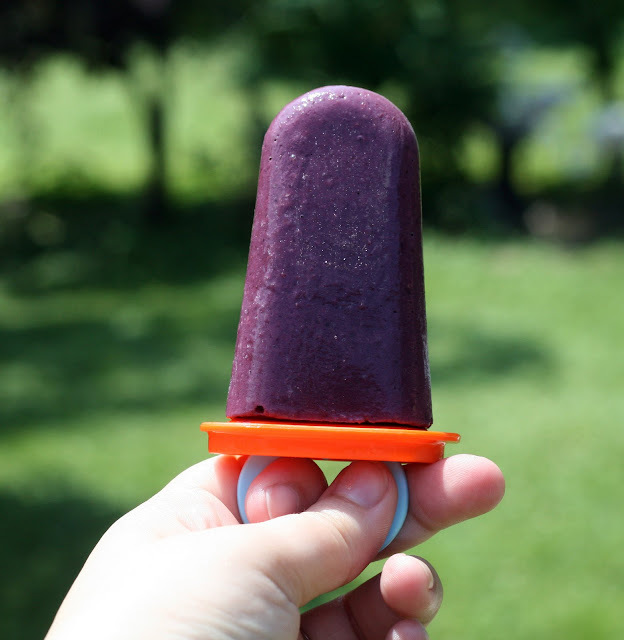 My husband the ice pop fiend has eating at least 2 homemade Popsicles a day! I don't eat anywhere near that many but these pops are really good. They are a little more "adult" tasting than most ice pops. They are not too sweet but really fruity. The shot of spicy ginger adds some heat and the yogurt gives them tang. The perfect treat for a hot summer day. Preheat oven to 350. Place the butter, flour and zest into a food processor. Add water one tablespoon at a time and pulse just until mixture sticks together. Form the dough into a ball then roll out on a floured surface. Place in a pie plate and prick with a fork. Bake 10-15 minutes or until golden. Cool before filling. Turn the oven up to 375. In a medium saucepan, whisk together the sugar, cornstarch, salt, water, blackberry juice and zest. Cook, stirring frequently, until mixture comes to a boil. Stir in butter. Place egg yolks in a small bowl and gradually whisk in 1/2 cup of hot sugar/juice mixture. Whisk the eggy mixture into remaining sugar mixture in the pan. Bring to a boil and continue to cook while stirring constantly until thick. Pour filling into the baked pie crust. In a large metal bowl (preferably one attached to a stand mixer), beat egg whites and cream of tartar until foamy. Add the sugar and continue to beat until stiff peaks form. Spread meringue over pie, sealing the edges at the crust. Bake for 10 minutes or until meringue is golden brown. Fully cool the pie before slicing. Note: I made the blackberry juice by forcing the berries through a sieve using a whisk. 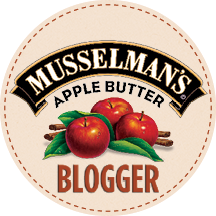 Taste it and if the juice is very sweet, reduce the sugar by a few tablespoons. Blackberry yields are still high every day and I have been scrambling for ways to use up the delicate berries before they turn. I've never made a meringue pie before but am completely comfortable with egg whites and making curd so I thought I'd give it a shot. I am glad I did. It was really easy and the results were fabulous. 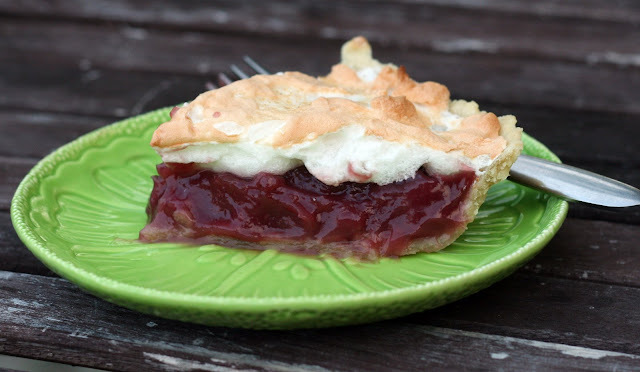 The blackberry flavor is deliciously strong, a perfect foil for the fluffy and slightly sweet meringue. Whisk together the flour, sugar, baking powder and salt in a medium sized bowl. Stir together sour cream and milk in a measuring cup. Whisk in the egg, vanilla and oil. Add the wet ingredients to the dry and stir to combine. Stir in the blackberries. Follow the instructions included with your waffle iron to complete the waffles. 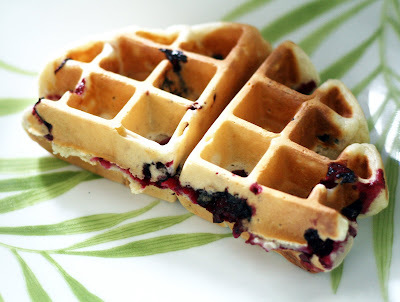 For most large, Belgian-style waffle irons you would use 1 cup of batter for each waffle. Our blackberry bush is doing very well this year. Just yesterday we picked almost a quart of blackberries. I looked at the other blackberry recipes I have made over the years (blackberry panna cotta, blackberry-vanilla cupcakes, blackberry cream cheese frosting, chipotle blackberry pulled pork, blackberry cornmeal cake, and blackberry clafouti) and realized that there are no breakfast recipes. I am rectifying that now. 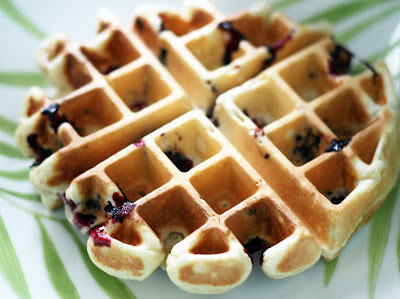 The delicate blackberries get smushed a bit which spreads out the flavor and gives the waffles a swirly, mottled look. I loved the bursts of sweet-tartness in the waffle. It was a real summertime treat without much fuss. Place the chipotle pepper, lime juice in a blender or food processor and pulse until fairly smooth. Pour the mixture into a medium bowl. Add the ground chicken, onion, chili powder, paprika and garlic powder. Gently mix together to evenly distribute all ingredients. Gently add the beans. If the mixture is overly wet, add a sprinkle of breadcrumbs. 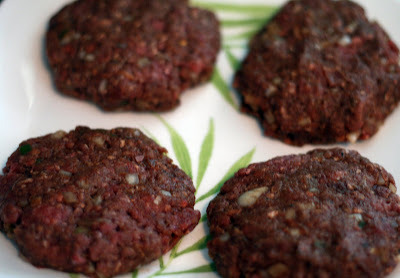 With lightly greased hands, form the meat into four 1/4 inch thick patties. Oil the rack of your grill. 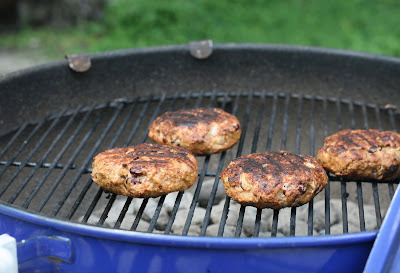 Cook the burgers over medium heat, covering as needed to insure that they are fully cooked through. Instead of simply pouring chili on plain burgers, these low fat burgers are actually chili in burger form. They have all of the ingredients, beans, peppers, onions, chili powder etc as chili made to fit on a bun. 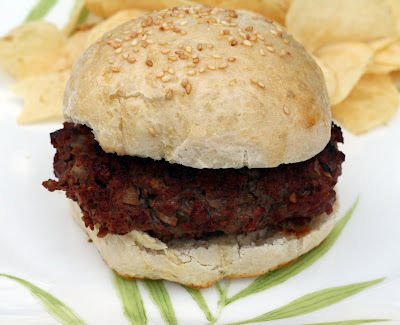 Ground chicken absorbs flavors wonderfully so these burgers are anything but bland. Serve them with chili toppings like cheese, avocado or even sour cream on top. Pour the boiling water into a cup with the sugar and tea bag. Allow to seep 3-4 minutes. Stir to dissolve the sugar. Pour the wine, brandy and triple sec into a large pitcher. Stir. Add the tea and the fruit. Refrigerate at least 6 hours before serving or overnight. 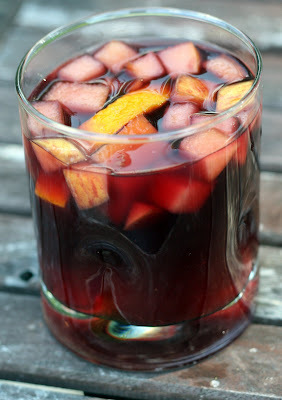 This is a smooth, not too sweet sangria that is perfect for summer sipping. We had tea infused sangria for brunch at a restaurant one day and I thought we could make an equally or possibly more delicious version at home. And we did. It is immensely sippable drink pairing wonderfully with almost any summer meal from breakfast (ahem, brunch) to dinner. It has a tropical sort of feel and the tea, although present, isn't a overpowering force. Cut off the tops of the lemongrass and discard. Chop up the fragrant bottom half. Place the chunks into a cheesecloth pouch and tie shut. In a medium saucepan, bring 3cups of the kiwifruit, lemongrass, lime juice and zest and the sugar to a boil, stirring occasionally to dissolve the sugar and spread the lemongrass flavor throughout. Meanwhile, whisk together the cornstarch and water, set aside. After the mixture comes to a boil, remove the lemongrass pouch, stir in the cornstarch mixture and cook 2 additional minutes. Remove from heat and stir in the remaining cup of kiwi. Pour into the prepared pie shell. 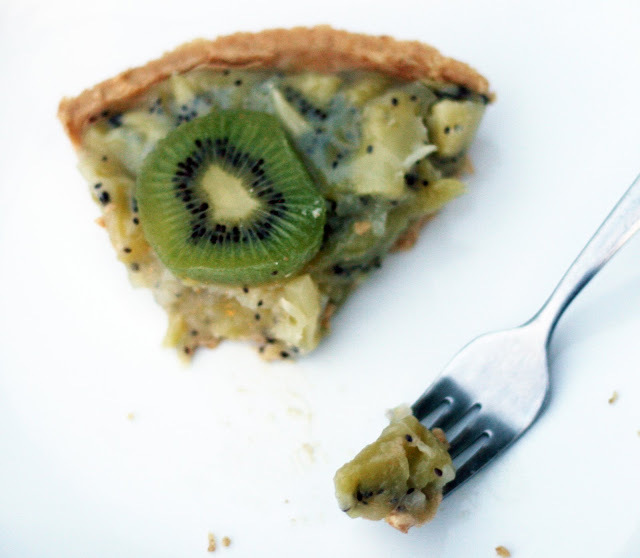 Top with additional sliced kiwi if desired. Cover and refrigerate for at least 6-8 hours or overnight before serving. Note: I really wanted to make this with a mix of green and yellow kiwi but alas, yellow kiwi proved elusive. It would have been pretty! Oh, I love icebox pies. I don't make them nearly often enough. They require no baking so they are perfect for the hot steamy days that we have settled into. Since our house is of an icebox era vintage and thus has no air condition (though of course we don't depend on the ice man to help us keep our perishables cool) any sort of baking during the summer months is done at your own peril. Now, a lot of icebox pies (the most popular being key lime) are creamy and a few are frozen, but I have decided I like the ones that are basically just-held-together fruit the best. 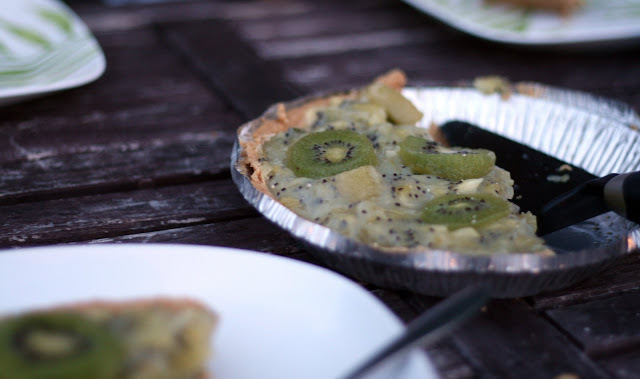 Now, kiwi is one of those fruits that reacts adversely to gelatin (it just won't firm up) but it behaves just fine when introduced to a cornstarch slurry. In fact, the resulting pie is so sturdy and since it has to be refrigerated overnight, one could even pack a slice for lunch. Or have it for breakfast if so inclined. Why relegate it simply to dessert? It is 90% fruit after all! One kiwi has more than the recommended daily allowance of vitamin C. So that makes this pie practically health food, right? So, keep your oven off! Let your pies set up in the fridge. Icebox pies are overdue for a comeback. 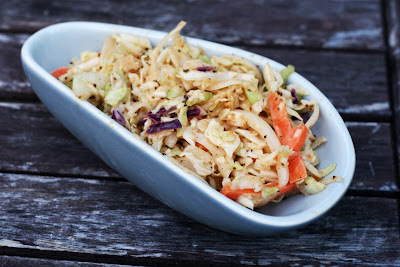 In a large bowl, toss together the coleslaw mix, celery and onion. In a small bowl, whisk together the lemon juice, Old Bay, celery seed and mayo. Pour over the vegetables. Stir to evenly distribute. Allow to sit 20 minutes before serving. Honestly, Baltimore Coleslaw is a bit of a misnomer. As far as I know there is no quintessential Baltimore slaw. But I haven't met a native yet that doesn't love Old Bay (I think they send us home from the hospital with a tin tucked into our blanket) so it seemed fitting. For the second time I used a preshredded coleslaw mix. It worked well the last time and was on sale for only $1 a bag so I couldn't resist. You could easily substitute an equal amount of hand shredded cabbages and carrot. The Old Bay, celery seed and celery sort of meld into really fresh tasting new kind of coleslaw, one that is peppery and summery. The fairly equal mix of mayo and lemon juice keep it from being too thick or worse yet, gloppy. Quick tip: I used my mandolin to slice the celery and onion very, very thinly. Preheat oven to 400. Grease or line 6 wells in a muffin tin. In a large bowl, whisk together flour, sugar, baking powder, ginger, baking soda and salt. Set aside. In a large bowl, mix together oil, sour cream, milk, egg and vanilla until blended. Add the dry ingredients. 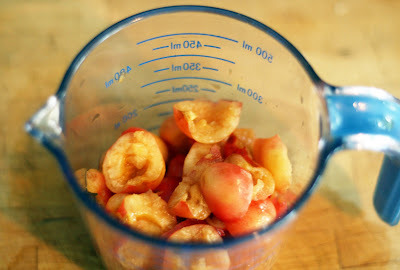 Mix the batter thoroughly then fold in cherries. Fill each well about 3/4 of the way. Top each with a cherry if desired. Bake 20 minutes or until toothpick comes out clean or with just a few dry crumbs. Remove to rack and allow to cool before serving. Note: Please take care if you top the muffins with whole cherries. The pit can present a choking hazard. 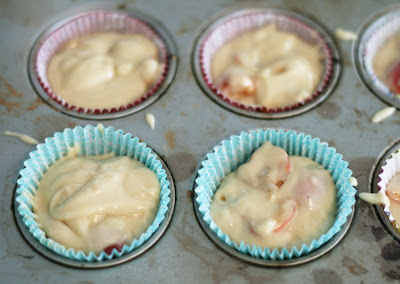 However, the cherries are quite easily removed before biting into the muffin. It is truly too hot to be baking but I have always wanted to make cherry muffins so I went for it. They are light and almost creamy tasting. Rainier cherries are quite delicate and normally rather expensive so I was delighted to see a whole pound of them for less than $2 at my local grocery store. 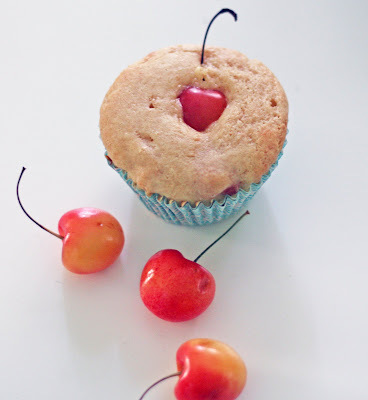 They are a sweet cherry but not cloyingly so and have a soft texture that works well in the muffin; they almost seem to melt spreading their juices throughout the muffin. Whisk the flour and yeast togehter in a large bowl. Place the sugar, salt, water and butter in a small sauce pan and heat until almost boiling. Allow to cool slightly. Pour over the flour and yeast and mix with a dough hook until a smooth, not too sticky ball of dough forms. 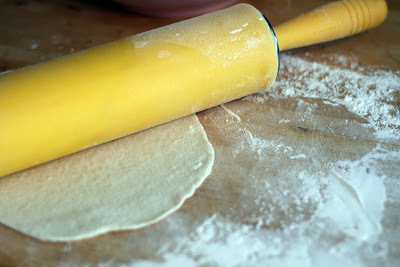 If the dough is very sticky, slowly mix in additional flour. Cover and allow to rise 1 hour. Meanwhile, prepare the meat. Saute the meat, onions and garlic in a large skillet until the onions just soften. Add the remaining ingredients. Stir. Cook until most of the liquid evaporates, stirring occasionally. Heat about 2 inches of canola oil in a deep frying pan or skillet. Divide dough into about 15 pieces. On a clean, floured surface, roll dough into discs about 1/4 inch thick circles about 6 inches in diameter. Fry until golden brown on each side. Drain both sides on paper towel lined plates. If they puff up a lot during frying, press with a paper towel to deflate. Place the meat on the center of the taco. Sprinkle with desired toppings. Fold in half to eat. Indian tacos started out as a Najavo invention but quickly grew to become a popular contemporary powwow and festival treat served all over North America. 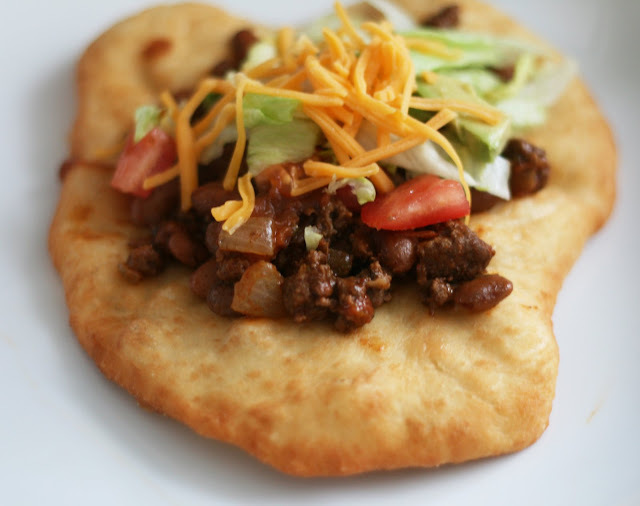 Fry bread was named the official state bread of South Dakota back in 2005 and Indian tacos became the official state dish of Arizona in 1995. There is even a National Indian Taco Competition in Oklahoma. They are the perfect fair food: fried, spicy and portable. And they are surprisingly easy to make at home. The fry bread comes together quickly and if cooked in hot oil and drained, much less greasy than you'd think. Some recipes call for baking soda instead of yeast but I find that a yeast dough yields a much more tender, tastier bread. Often the beans in Indian tacos are served as a topping but adding them to the meat imbues them with flavor and eliminates the need to heat them separately. Bison is an extremely lean meat that works well with strong spices and isn't as "heavy" as ground beef-perfect for use in a dish like Indian tacos. Note: you can also bake the dough for the fry bread at 450 for a few minutes to make a tasty flatbread. Halve and slice the radishes. Place the greens, nuts, shallot, garlic, oil, cheese, salt and pepper in a blender or food processor. Pulse until smooth. Boil the potatoes in salted water until fork-tender. Drain the potatoes. Toss the radishes and potatoes together. 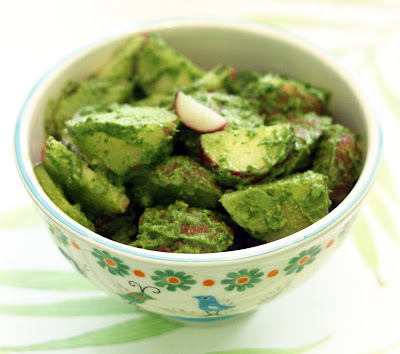 Drizzle with pesto, toss to evenly distribute. Radish leaves are perfectly edible. They have the peppery bite that you would expect but they are mild enough to use in a salad. Since radishes are in season right now, it is easy to find radishes with their leaves still attached. Look for leaves that are still crisp with no bruising. Anyway, they are so tasty, I felt bad about tossing them out but I didn't have any other salad ingredients (besides whole radishes, obviously) so I decided to make a pesto. Since we had just had pasta, I tossed with some potatoes instead. The result? A creamy potato salad with no mayo but lots of fresh flavor. With a light hand, mix all ingredients together. Form into four equal, 1/4 inch thick patties. 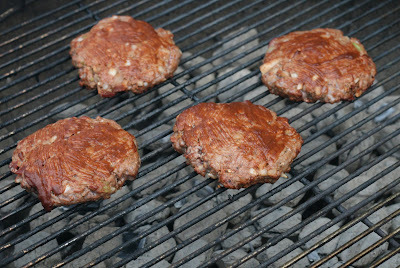 Brush one side of each patty with additional barbecue sauce. Place the burgers, sauce side up, on a hot grill. About halfway through the cooking time, flip the burgers. Place mesquite chips in a foil packet, poke holes in the foil, and place on the coals. Cover and cook until the burgers are to your desired doneness. Serve on hamburger rolls. *I used this. I've seen other brands refer to a similar mix as "Canadian" steak seasoning. These slightly over the top burgers are sure to become a new favorite. For best results, use lean beef and bacon. 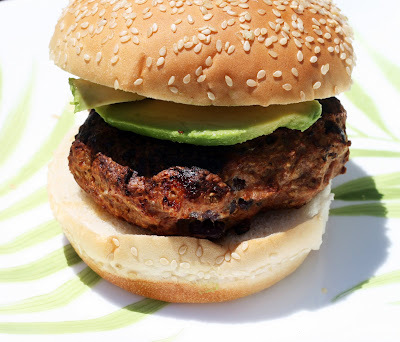 Higher fat meats may cause the burgers to fall apart during grilling. Believe me, you won't miss the extra fat. Between the smoky bacon, the peppery cubanelle and the yummy barbecue sauce, they are bursting with flavor and quite juicy. Whisk together the dressing ingredients in a small bowl. Place the remaining ingredients in a medium bowl. Drizzle with dressing and toss to evenly distribute. Allow to sit 20 minutes before serving. 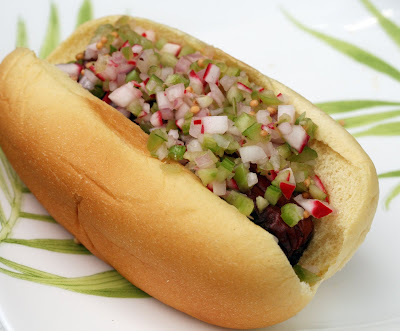 I am generally a sauerkraut and/or mustard girl when it comes to hot dogs but for some reason the idea of a radish relish (which I had never even heard of before) stuck in my head. As it turns out, it was really good. I had it on a bison hot dog and enjoyed the pickley, spicy, zippy bit of crunch it provided. I also think this relish would be great on grilled fish or even chicken. It is just so fresh tasting and crisp, it really brightens up whatever it is put on. 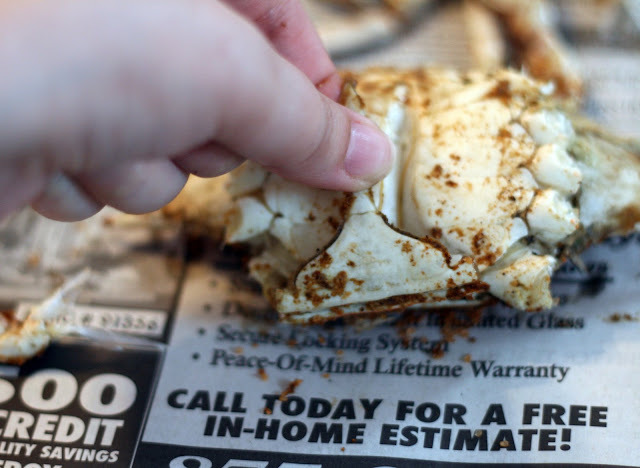 Crabs are sold by size: small, medium, large, jumbo and occasionally colossal. They can be very expensive (especially if you buy them already steamed) and the price difference between the sizes can be significant. I recommend getting at least the medium size. The size difference between medium and large is often slight but the price difference is frequently about $10 a dozen. Picking crabs is time consuming. 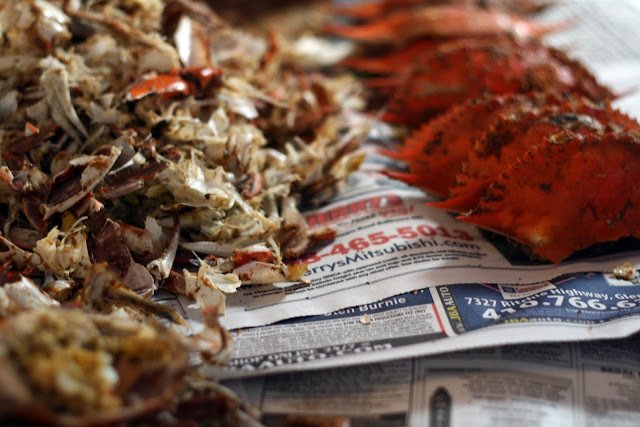 Unless you are a professional, plan to spend the bulk of an afternoon or evening picking crabs. Your hands will get very dirty. 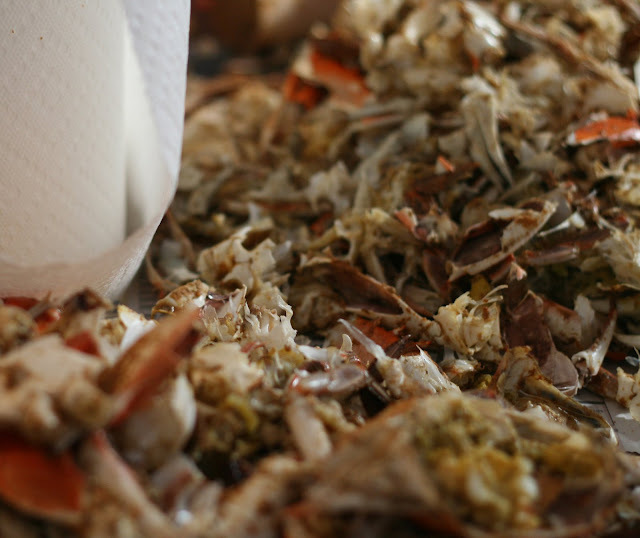 I find it is difficult to eat anything but crabs while you are picking unless you're willing to get up and wash your hands frequently. 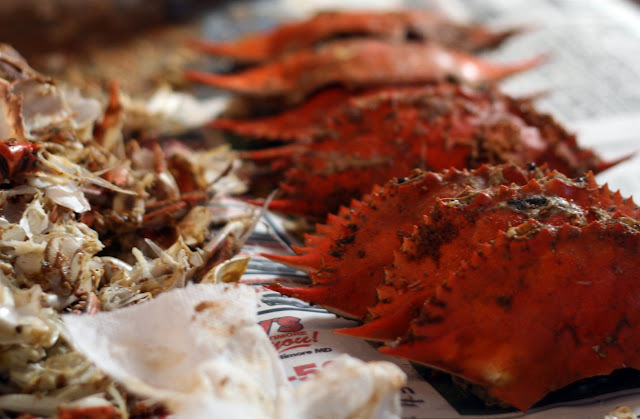 If you want to serve other food, I suggest serving it before or after the crabs. Avoid touching your eyes while picking, seafood seasoning burns. 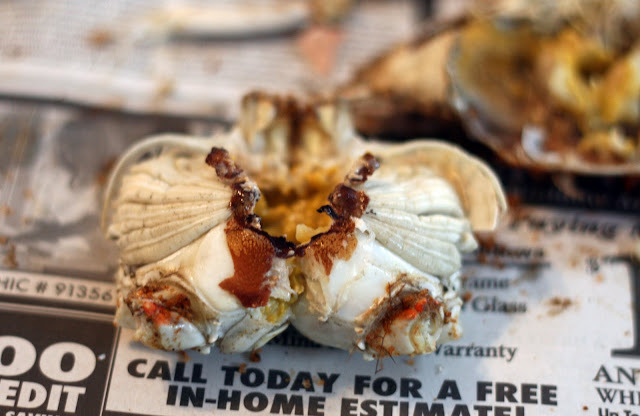 Also, it is not uncommon to cut your finger on a shell but it is generally no worse than a papercut. 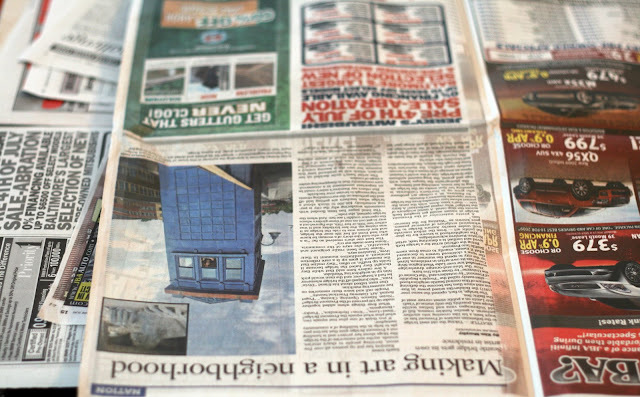 Cover a large dining surface with a thicker than you would think layer of newspaper. It really is best to do this outside on a picnic table if at all possible. If not, resign yourself to cleaning the floor afterwards. Pick out a crab. Try and get one that has both claws and feels "heavy" before someone else does. Bend or twist the legs and claws to snap them off at the body. Some times a bit of crabmeat will come off with the legs or claw. Eat it. Set the claws aside. There is not much meat (if any) in the legs so I just push them aside. Pull off the "apron". Some people use a butter knife for this but I am a purist and only use my hands. Simply slip your finger under the edge of the point and pull down. It should pull off easily. 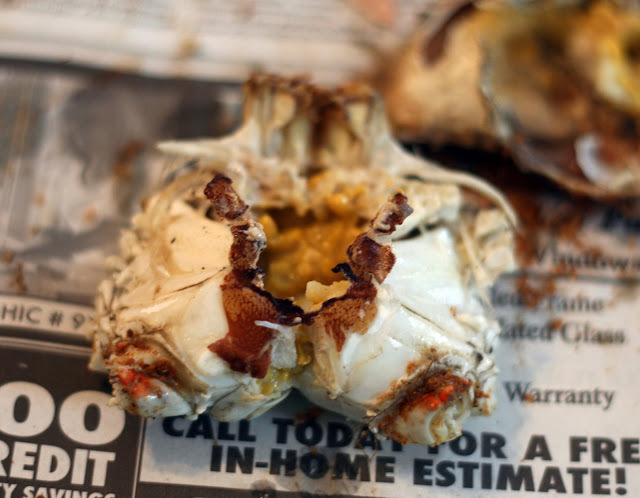 Pry the shell away from the body. 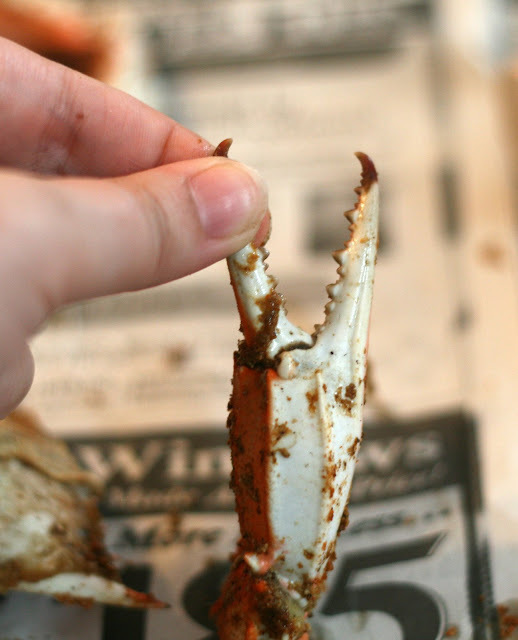 The easiest way is to use both hands and pull the crab halves in opposite directions. Remove the squishy, grey gills. They pull off very easily. Discard them. 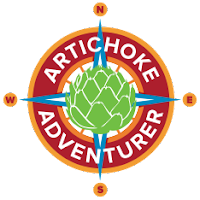 The yellow stuff is colloquially known as the "mustard" and is edible. 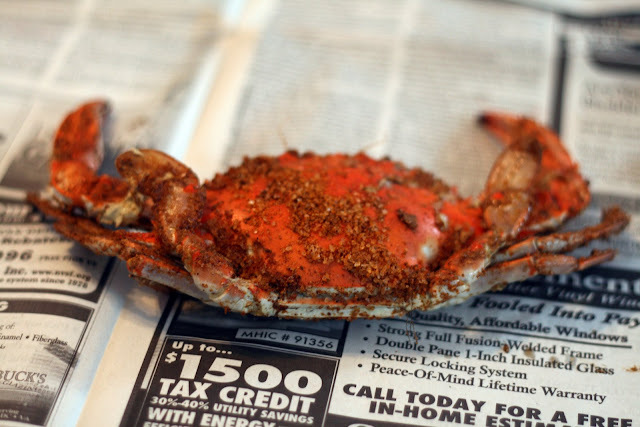 Crack the crab in two. 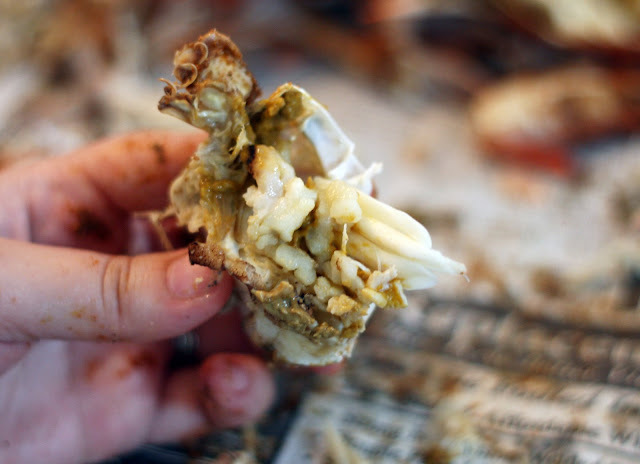 Pull out any loose crabmeat and eat it. Crack the halves and extract the meat. 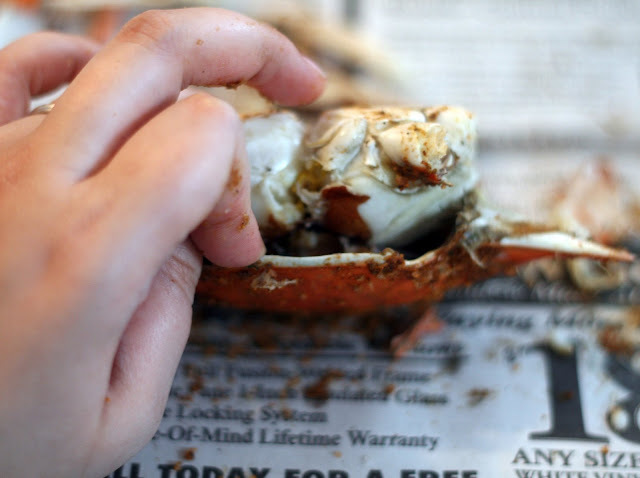 Again, some people use butter or crab knives but I find that fingers work just fine. Eat the meat as you go. 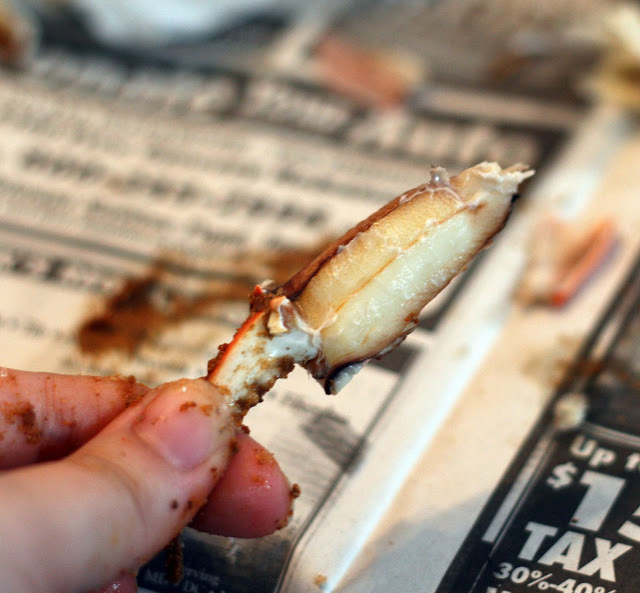 Hold both sides of the crab claw and break off the part that I am holding in my fingers. The meat should come off on the claw. If not, break the claw with your mallet. The other half of the claw has meat as well. Break it off at the joint. If this doesn't yield meat, hit it with your mallet. 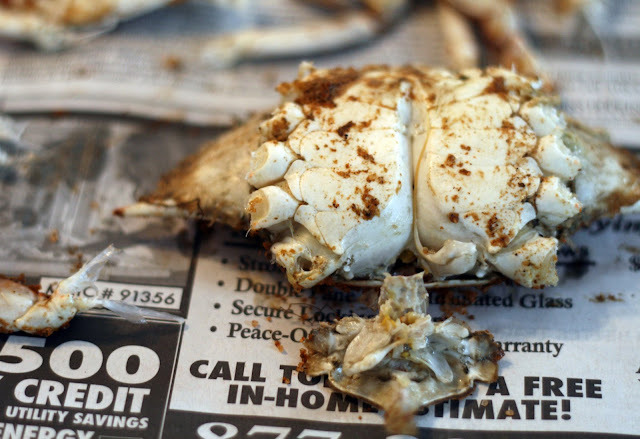 Steamed hard shell blue crabs are a staple here in Baltimore and I think us natives possess innate knowledge of how to pick crabs. However, I realize that this isn't true of many people, my husband included. Last year I posted a how to steam crabs that was well received. After that post, I got quite a few requests for a how to pick crabs post. I had tried to take pictures of the picking process at the time but it is hard enough to photograph yourself but covered in seafood seasoning? Nearly impossible. So I waited until we had crabs again and tried again with much more success. 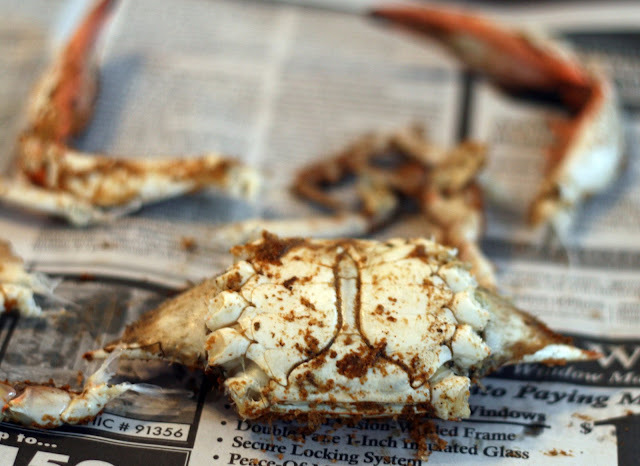 Having a crab feast is a lot of fun and it is a shame to miss it because you are crab-wary! 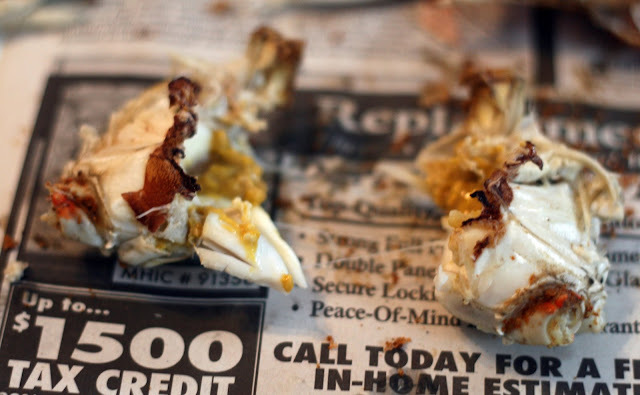 Now everyone has a slightly different crab picking style but this is all you really need to get the most out of your crabs. Pulse all ingredients in a blender until smooth. Pour into a small saucepan and simmer on the lowest setting for 15 minutes or until heated through and slightly thickened. Allow to cool completely. 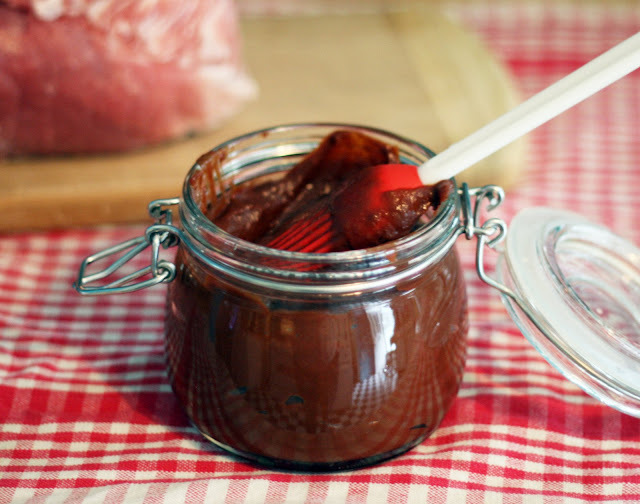 Pour into an airtight container and refrigerate. This year I have found a new interest in making homemade barbecue sauces. It wasn't that I had been using bottled sauces until now, I hadn't been using any barbecue sauce at all until this summer. The few times I encountered a bottled sauce they were always too sweet or weak tasting. So I decided to start making my own. It seemed like most of the tomato-based recipes I came across called for my old nemesis, ketchup. Since I detest ketchup and its cloying sweetness, I knew that was not for me. So I decided to use intensely flavored tomato paste as a base and add some of my favorite ingredients to create my own ultimate sauce. The balsamic adds a fruity roundness, the coke adds a light sweetness (and no one would guess that it was an ingredient at all!) and the savory Worcestershire sauce adds an extra depth of flavor. I wanted a spicy-smoky note in the sauce so in went a dash of my favorite mesquite liquid smoke and ground chipotle pepper. The result? A tangy, spicy, smoky, not-too-sweet sauce that is perfect for any meat. 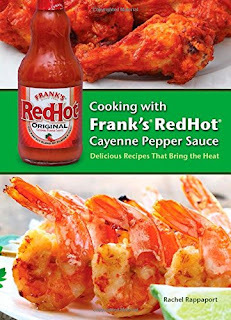 This sauce is also fantastic drizzled over pork or beef sandwiches, meatballs or in pulled pork.